Live Tracking allows you to monitor the status of your drivers' deliveries throughout the day. **Drivers must use Routific's mobile app for Live Tracking to work! ** Drivers' progress is determined by what they enter into the mobile app. 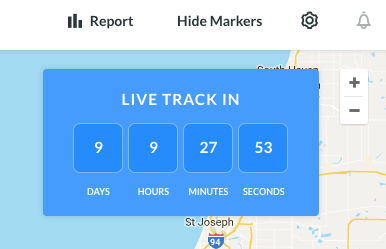 If you've planned routes in advance, you'll see a count down on the top-right of your screen letting you know when Live Tracking will become available. The live dashboard will appear when it's time for your drivers to hit the road and only after you've dispatched the routes successfully. The vertical blue line indicates the current time. This line will move as time passes. Green boxes are completed stops. This means your driver marked a stop as complete in their mobile app. Red boxes are incomplete stops. This means your driver marked a stop as skipped in their mobile app. Yellow boxes are completed, but late. This means your driver marked a stop as complete in their app, but this happened outside of the originally estimated time window. Toggle to 'Plan' mode to make changes to routes after they've been dispatched. When you're finished with the changes, make sure you click "Save & Update" before toggling back to Live mode. 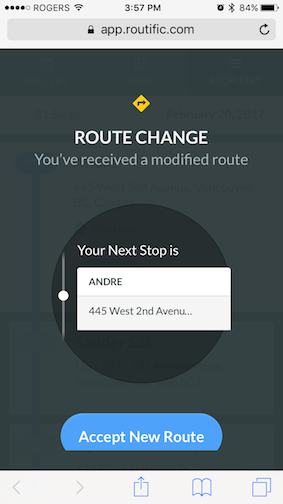 When you click "Save & Update", your drivers will receive a text notification on their phone that the route has been updated. 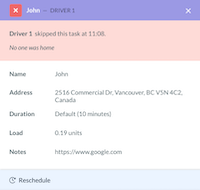 If you need to reschedule a stop that a driver skipped for later in the day, just click the missed stop to bring up the stop details, and click "Reschedule" in blue at the bottom. This will preserve the record of the skipped stop, but creates a duplicate stop that is unscheduled. You can use the "Insert Unscheduled" button to insert it into the route automatically, or drag and stop the stop to insert it manually. Make sure to publish the changes so your driver can see their newly updated route.